New Zealand is an amazing country to visit, with spectacular scenery, amazing natural wonders, and unique wildlife. Since the country consists of two large islands and many more small ones, a cruise ship is a perfect way to see much of New Zealand. Most cruises visit both the North and South Islands of New Zealand, and some small expedition ships like the Silversea Silver Discoverer include the sub-Antarctic islands of New Zealand on their adventure itineraries. Explore the towns of Picton, Christchurch, and Dunedin. Here are the best things you'll see when cruising around the South Island of New Zealand on a ship, starting with one of the highlights of New Zealand that can best be seen from a ship — Fiordland. Fiordland is the region covering the southwest corner of the South Island of New Zealand. Fiordland National Park occupies over 4,800 square miles of Fiordland, and since the park has 134 miles of shoreline and is deeply indented by 14 fiords, a ship is the best way to explore the park and region. It's important to note that "fjord" and "fiord" are both acceptable spellings of the same thing. Most of the world spells these deep valleys cut by glaciers and drowned by the seas as "fjords", but New Zealand spells them "fiords". Visitors to Fiordland are treated to amazing scenery and New Zealand wildlife. Depending on wind and weather conditions, cruise ships can visit three fiords that were incorrectly called sounds by the early explorers--Dusky Sound, Doubtful Sound, and Milford Sound. The designation is incorrect, but the names stuck. Dusky Sound is the longest fiord in Fiordland, extending 25 miles inland. It's also one of the widest since it is five miles across at its widest point. This size allows even large cruise ships to enter and provide scenic cruising for guests. One highlight of a visit to Dusky Sound is a stop at Captain Cook's old camp, where he and his men spent five weeks in 1773. It's called astronomer's point, because one of their accomplishments was to test the accuracy of the world's first chronometer, which measured longitude. (Latitude measurements had been done years earlier.) Due to all the astronomical measurements made by Cook's men at this campsite, it became the most accurately located place on earth at the time. One problem Cook and his team experienced is still there: sand flies! Anyone going ashore to see the camp needs to wear bug spray. Aside from sand flies, cruise guests might see all sorts of fascinating wildlife in Fiordland. Since Dusky Sound is one of the largest fiords, it has more room for wildlife. Seals, dolphins, many types of birds, and whales are often seen, but the most unique species is the rare Fiordland crested penguin, one of only three species of penguins that lives on the New Zealand mainland. (The other two species are the yellow-eyed penguin and the little blue penguin.) The Fiordland crested penguins breed in Dusky Sound and sightings are not uncommon, especially if you are exploring in a small boat from an expedition ship like the Silver Discoverer. Doubtful Sound is the second fiord that cruise ships can sometimes enter. However, large ships usually cannot pass through the narrow opening to the fiord since it is dotted with rocks and tiny islands covered with seals. It's so narrow that in 1770 Captain Cook named it Doubtful Sound because he wasn't sure his ship would be able to sail out of the fiord once it entered. He chose not to even attempt the narrow passage. Since the opening to Doubtful Sound is so small, it's much quieter than its neighbors Dusky Sound and Milford Sound. However, as seen in the aerial photo above, the sound is surrounded by towering cliffs and the fiord is quite long. It even splits into three narrow arms. Those who visit during rainy season might see hundreds of waterfalls plunging down the cliffs into the fiord. Small motorized expedition ships can usually enter Doubtful Sound, although it's easy to see why sailing ships like Captain Cook's might choose to move on to the next fiord. Inside Doubtful Sound on a calm day can lead to great photos such as this one. Ten-mile long Milford Sound is the northernmost fiord in Fiordland. Technically, Milford Sound is a bay since it doesn't have but one entrance, but everyone calls it a sound. It is New Zealand's most famous tourist destination and can be reached by boat, small plane, hiking trail, or on a dead end highway that starts in Te Anau. The 75-mile drive between Te Anau and Milford Sound is one of the world's most scenic drives. Some cruise ships offer shore excursions in Milford Sound that include a bus ride to either Te Anau or to Queenstown. The "town" of Milford Sound has 120 residents, a small hotel/cafe and a tiny airstrip. Cruise ships enter Milford Sound and slowly move about the sound, giving the guests the opportunity to see the towering cliffs and waterfalls. The mountains near the Sound are almost a mile high, and the cliffs towering over the Sound soar up 3,000 feet. The Sound has two permanent waterfalls, but when it's raining, more waterfalls appear and the flow is heavier. Everyone who visits Milford Sound must take a photo of Mitre Peak. The peak is named for its dramatic pyramid shape that looks like a bishop's hat, and soars over 5500 feet into the sky. Cruise ships circumnavigating the South Island of New Zealand leave the southwest side of the island and sail towards the northeast and the Marlborough region of New Zealand. The Marlborough Sounds are not in Fiordland, but these scenic sounds on the northeast coast of the South Island of New Zealand also feature many islands, bays, and tiny coves. One popular place for cruise ships to visit is Motuara Island located in Queen Charlotte Sound. Ships anchor in the harbor between Motouara and Ship Cove, using their small boats to take guests ashore. Motuara Island is a historic site and predator-free wildlife sanctuary with good walking trails. Visitors love seeing all of the bird life, which are very plentiful since there are no predators. These birds are fearless and fly right up to you! Motuara Island guards the entrance to Queen Charlotte Sound. It was completely cleared of vegetation and farmed in the early 1900's. Pests came along with the farmers, but they were eradicated in 1991. Today the second generation forest has re-grown, making it a terrific place for bird lovers to visit. A hike up to the summit of the only hill on the mountain, takes about 45 minutes if you stop along the way to look at the amazing views of Queen Charlotte Sound, the plentiful New Zealand robins (black with white breast), and other birds. Cruise travelers can see numerous breeding boxes for the tiny blue penguins, who prefer these man-made homes to building their own nests. Depending on the time of year, you can see baby birds inside on the nests. A monument to Captain Cook is located at Ship Cove, just across the Queen Charlotte Sound from Motuara Island. Ship Cove was Captain James Cook's base of operations in New Zealand, and over five voyages, he spent 168 days there during the 1770's. It was a perfect camp setting due to the good shelter and fresh water. Today Ship Cove is a park with walking trails and picnic tables for day trippers. Other than Captain Cook, the small park is most famous as one end of the Queen Charlotte Track, one of the most popular hiking trails in New Zealand. This 44-mile hiking (or mountain biking) trail links Ship Cove with the town of Anakiwa. This track is different from most of the other government-sponsored trails in New Zealand since it does not feature small huts for hikers to camp in, even though the track takes 3 to 5 days to complete (one way). The huts aren't needed because delightful inns are found along the way. Hikers can also use water taxis to complete shorter sections of the track. It all seems very civilized, doesn't it? Unfortunately, the Queen Charlotte Track is only an option for cruise travelers who extend their trip in New Zealand or arrive early. Wine lovers will recognize the Marlborough wine region of New Zealand as the home of some of the world's best wines, especially Sauvignon blanc. The large wine growing region near Blenheim in the Wairau Valley is just a short drive from where cruise ships dock in Picton and the Marlborough Sounds. It's fun to visit one or more of the vineyards or wineries on a tour to taste some of the marvelous New Zealand Marlborough wines. Learning about the history of vineyards and wine-making in the Marlborough area adds to the experience. Back in the 1980's, when New Zealand farmers were first growing grapes, land could be bought for about $2000/acre. That same land sells today for over $250,000/acre! Because of the cold weather, the Sauvignon blanc is much drier in the Marlborough valley than from drier locales like California and Australia. The Marlborough valley Sauvignon blanc is the "most profitable" wine in the world because it is cheaper than wines grown elsewhere that taste similar. For example, French Sancerre (France's Sauvignon blanc) usually sells for at least three times as much as a comparable Savignon blanc from Malborough. New Zealand wineries are able to sell more, and their land investment is much less than in France. One other interesting fact--the screw-cap wine bottles that many white wine drinkers have grown to love are avidly supported by New Zealand vintners as part of the New Zealand Screw Cap Initiative. Continuing south along the eastern coast of New Zealand's South Island, the next stop for cruise ships is Kaikoura. 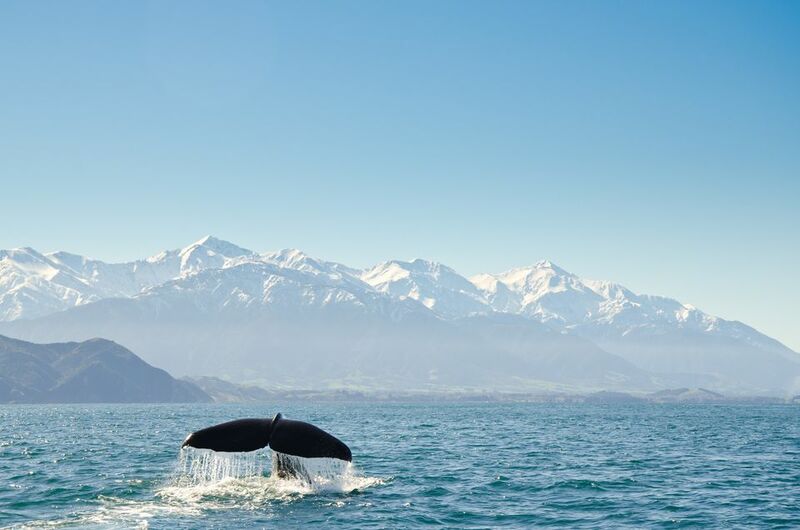 Kaikoura is a booming tourist town, primarily because of the marine life in Kaikoura Bay. This bay is very deep and warm and cold ocean currents meet and mix in the bay, forcing many nutrients up towards the surface. Marine creatures are drawn to this food and provide great shows for tourists. Several local tour companies take visitors on wildlife watching boat tours out into the bay. Sperm whales and dusky dolphins are the "stars" of the show, but seals and many species of birds are often seen in the bay. It's a great way to spend a few hours in Kaikoura, especially if the wildlife cooperates! In addition to the wildlife in Kaikoura Bay, the town of Kaikoura has a fascinating trail that follows the cliffs and shoreline of the Kaikoura Peninsula. The hike is up and down, but the views of the sea and surrounding town and countryside make the trek well worth it. Cruise passengers visiting Kaikoura for the day have enough time to do the whale-watching tour and hike along the cliff if they don't want to do any shopping. A circumnavigation cruise of the South Island of New Zealand might start and end in Dunedin or Christchurch since these two cities have the largest airports on the South Island. Both of these towns, along with Picton on the northern coast of the island, are well worth a visit of a day or more. These are only some of the highlights that can be seen either from your cruise ship, a small boat like a Zodiac, or within just a short distance from the coastline. New Zealand is certainly a marvelous cruise destination, no matter where your ship stops!